As leaves start to change color and fall, the garden slowly transitions into what will soon be a restful sleep. Although it has been one of the warmest Octobers I can remember with temperatures in the 80's on some days, autumn is a changing time for the garden as past blooms fade and new interest appears. 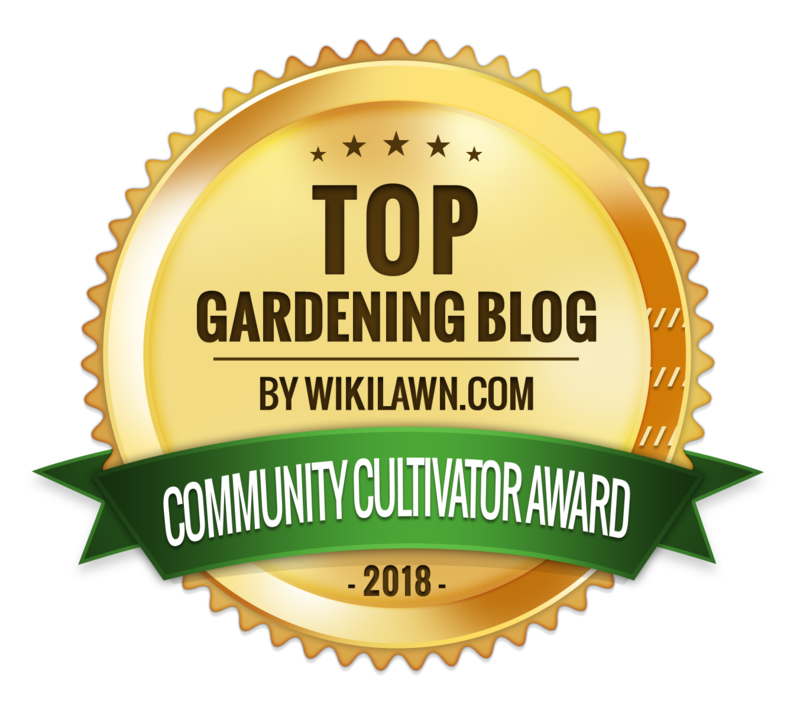 It's time for another Garden Bloggers' Bloom Day and Foliage Follow-Up to view the changes in my Long Island garden. Come take a peaceful stroll with me and experience all that nature has to offer. 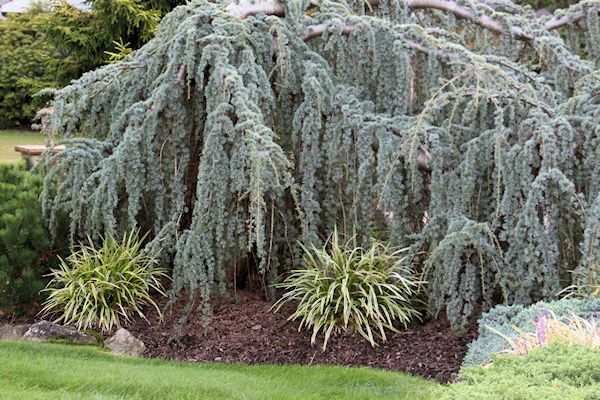 We start the tour along the southeastern portion of the property where Cedrus atlantica glauca 'Pendula' (Weeping Blue Atlas Cedar) cascades along the driveway. It is one of my favorite pieces on the property as it becomes even more graceful and magnificent with each passing year. 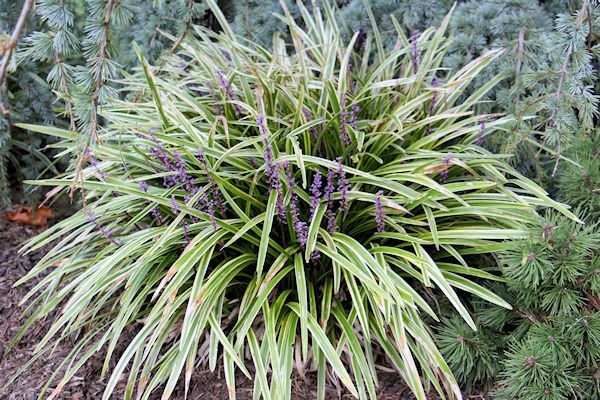 Along the front of the bed is Variegated Liriope (Lillyturf), which displays purple blooms on stalks, that rise up out of its grass-like foliage late summer into fall. 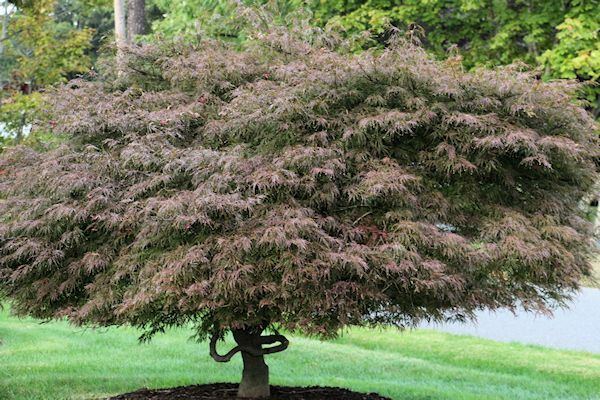 The Weeping Japanese Maple on the front lawn is starting to show signs of change and interest will be left to the structure of its twisting trunk, which you will see on one of your wintertime visits. The leaves of the trees along the street behind the maple are also starting to change, showing hints of orange and yellow. 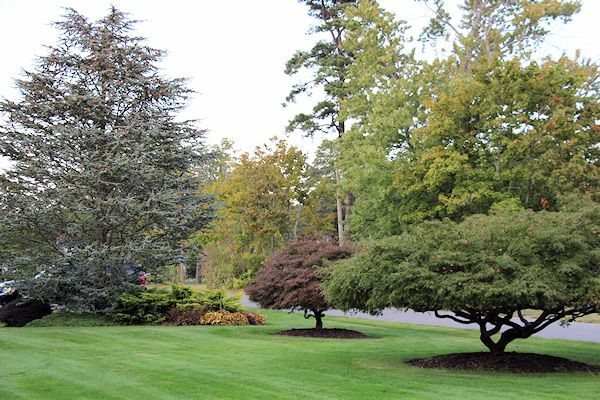 As we pass along the driveway, you can get a good view of Coral Bark Maple (Acer palmatum ‘Sango-kaku’) behind Skyland's Golden Oriental Spruce (Picea orientalis 'Skylands'). The leaves of the Coral Bark Maple will turn a fiery golden orange as the months go on. Both trees gave reached a height of about 20 feet over the years. 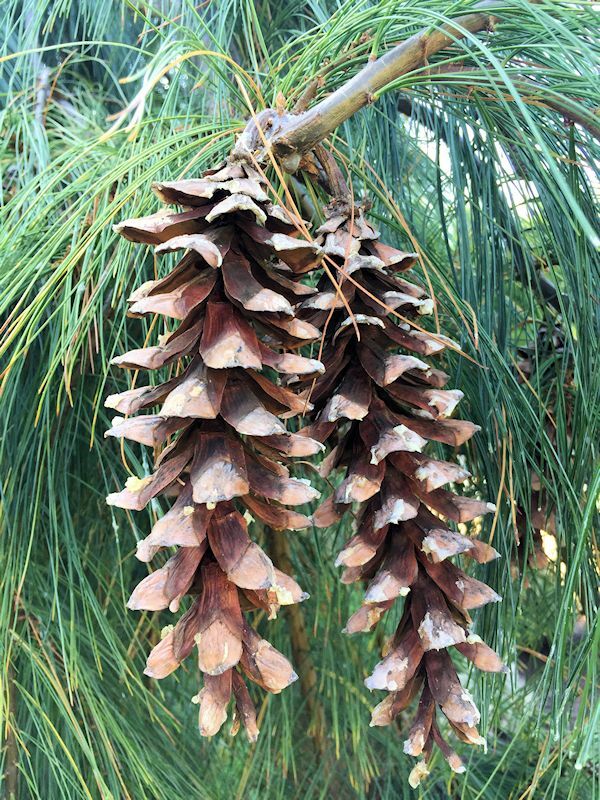 'Skylands' is slow-growing, and displays an upright, conical-pyramidal form that eventually reaches a height and spread of 35' tall by 10-12' wide. 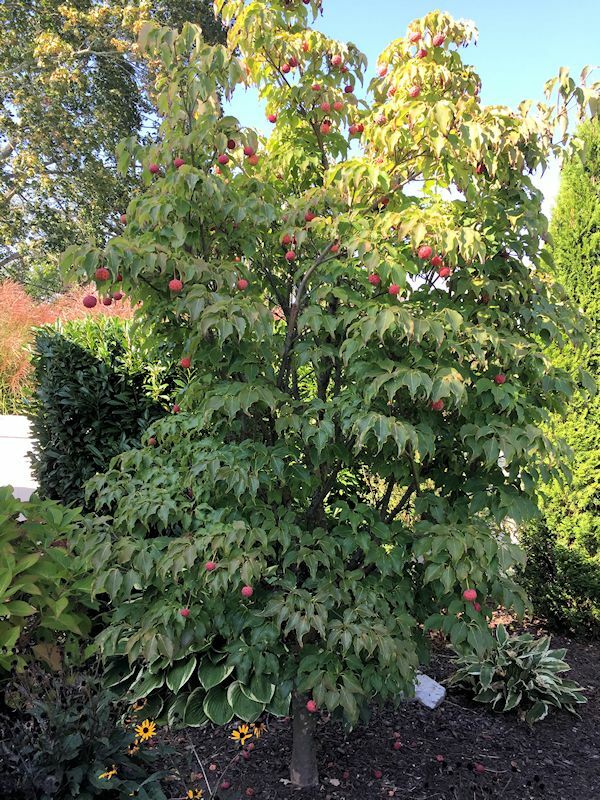 Coral Bark Maple generally reaches a height and width of about 15-20 feet. 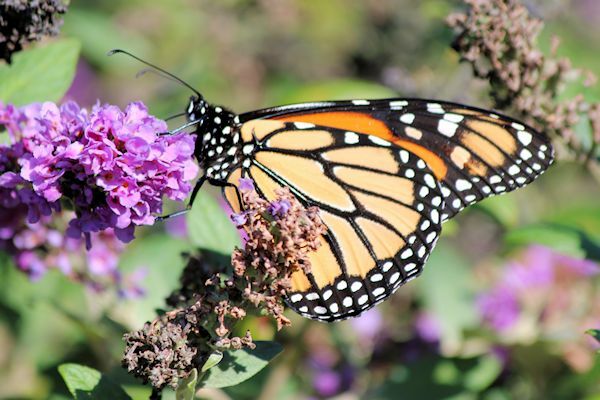 I have been watching for Monarchs all summer long and they have finally arrived, seeking the blooms of the Butterfly Bush. This one is particularly skittish, so we have to make sure not to scare him off. He has found a favorite place at this shrub. We had passed by some Liriope in bloom in the southeast garden. Here it is close up with its purple spikes of blooms. Around the bend is Spirea Big Bang 'Double Play', which just keeps on giving. It starts blooming late spring into early summer and still continues to push out some last flowers into fall. Here it is closer up. 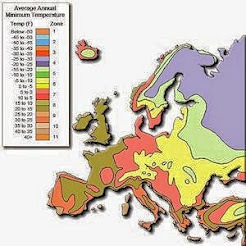 No wonder it was given the name 'Big Bang'! It refuses to quit! 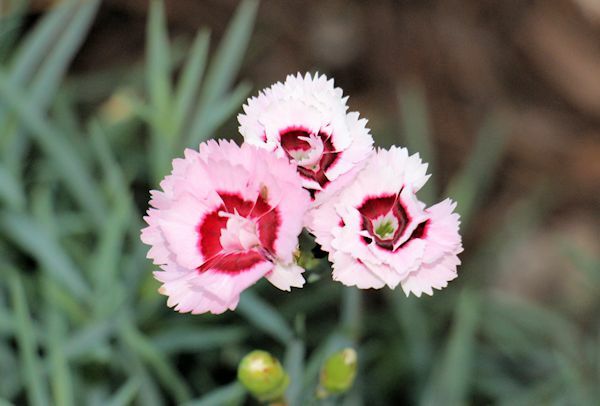 Another plant that refuses to quit is Dianthus 'Raspberry Surprise'. This is its first season in my garden and the more I deadhead it, the more it blooms! 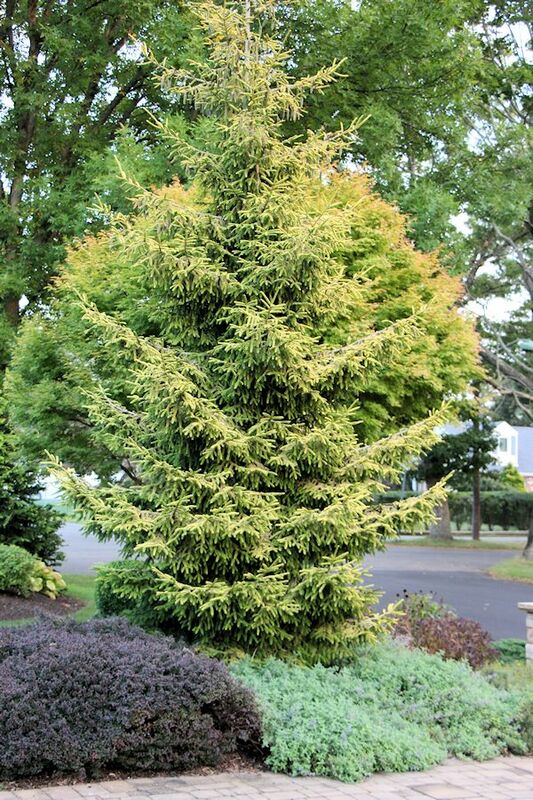 An added plus is that its greenish-grey foliage is supposed to remain evergreen. There are more blooms to be seen here in the back perennial border. Daylily 'Stella D Oro' just keeps on giving. 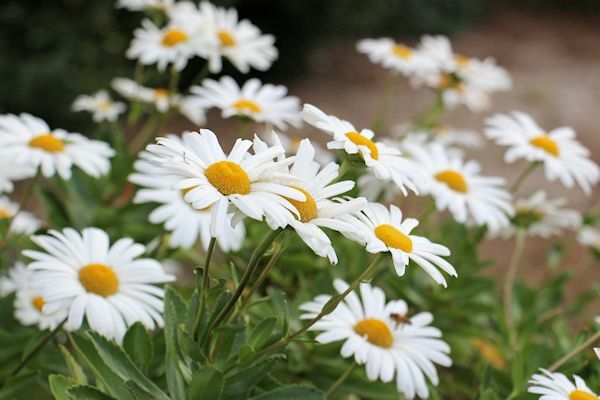 You probably saw its blooms last month after I had rejuvenated it, and they should continue into the first frost. 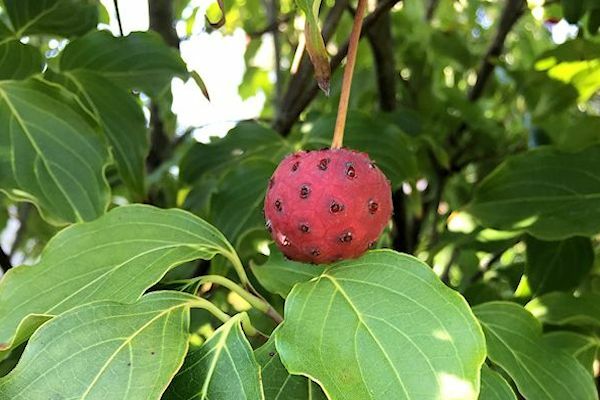 One of the newer additions to the garden is Japanese Kousa Dogwood 'Greensleves'. I added it to the back northwestern section of the property last summer and it produced the most beautiful greenish-white blooms this past spring. Along with its attractive foliage, the tree is now covered in large red fruits, which are also a great food source for the birds. Come up and get a closer look! The fruit are about 3/4 to 1 inch in diameter. and the large cones it produces are enjoyable too! A clear sign that autumn is upon us is the arrival of large feathery plumes on Maiden Grass 'Yaku Jima'. 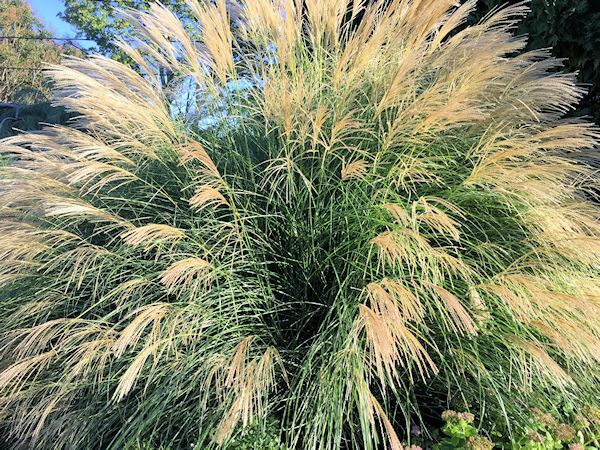 'Yaku Jima' is a dwarf variety of ornamental grass, only growing to a height of four feet (5-6 feet including its plumes), so it stays quite upright. There are some blooms that just keep the garden season going. Double Knock Out Roses are certainly one of them. 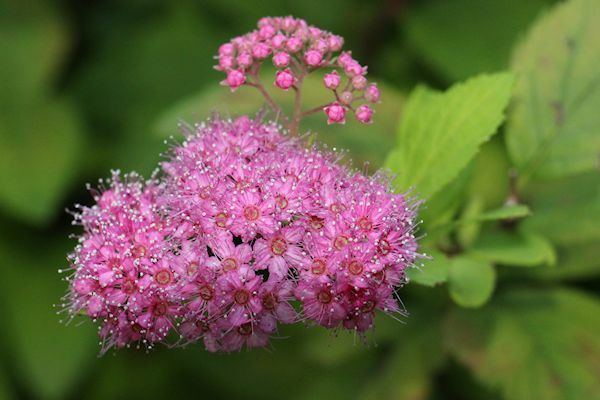 These bloom throughout the entire summer and into the first fall frost, which is usually sometime in late November. I have even had buds in December on occasion! What is the secret to non-stop blooms? I keep my roses well pruned for fullness, and feed them once a month with a high phosphorus rose food. 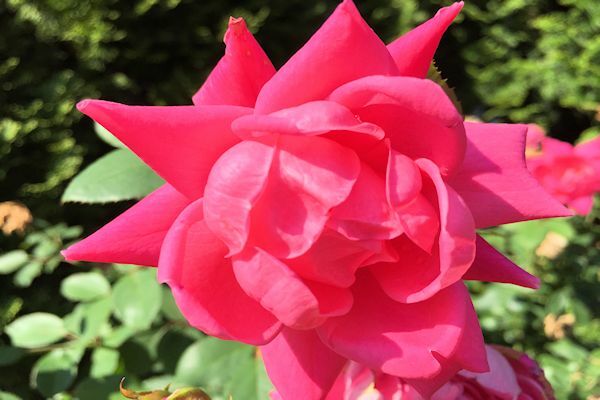 Knock Out Roses are more disease resistant than traditional types and don't require much deadheading. 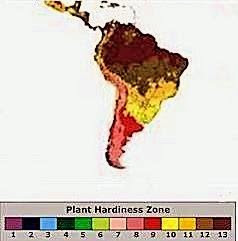 With a little loving care, they will bloom for months. 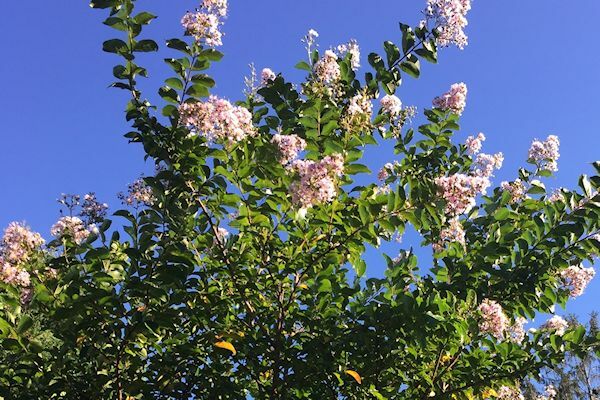 As we tour around to the back southwest corner of the property, Crape Myrtle 'Muskogee' which was added in 2015 is now doing well. During the first couple of years the blooms were minimal, but now it has been blooming profusely since the beginning of August. I think the plant just needed a couple of seasons to get a good root system, and am hoping that it will continue to thrive. 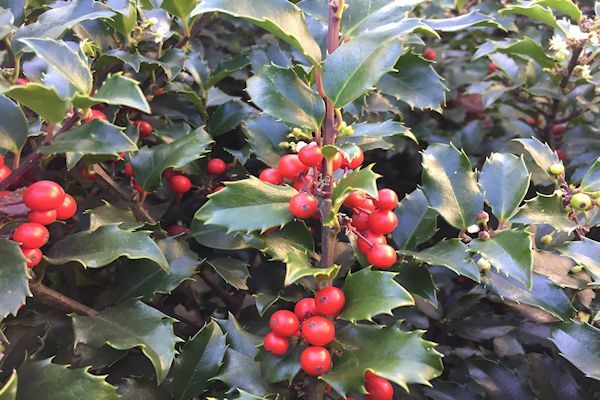 One thing I love about autumn is how vibrant the bright red berries look on holly. It only proves to show that there is beauty in every season. 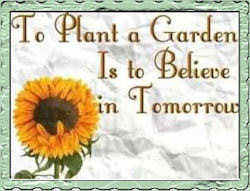 As a gardener with a passion for all things green, I have come to appreciate nature's artwork. Along the pool backdrop you can see the Green Giant Arborvitae that were planted as a replacement for the Eastern White Pines, destroyed by Hurricane Sandy in 2012. They were put in at 7-8 feet, and have now doubled in size. 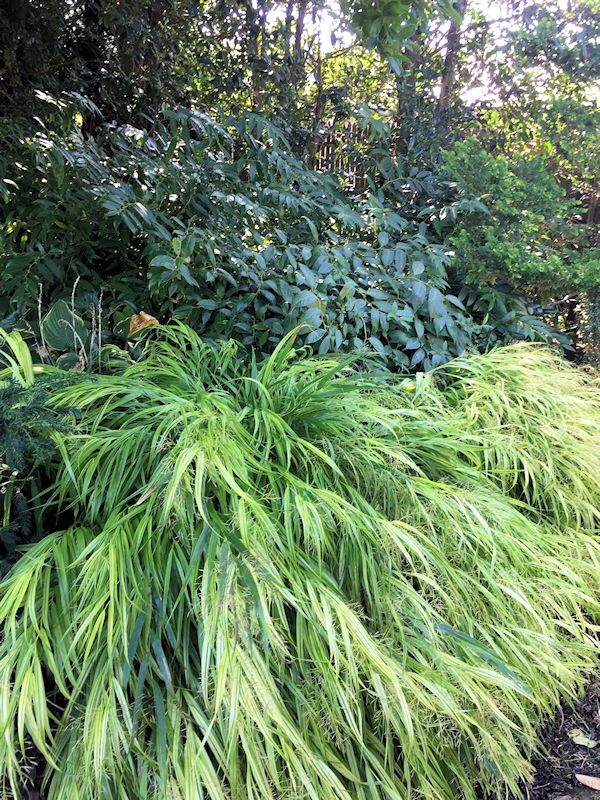 In the foreground are Golden Japanese Sedge, an evergreen perennial that forms a rounded mound the size of a mature hosta. 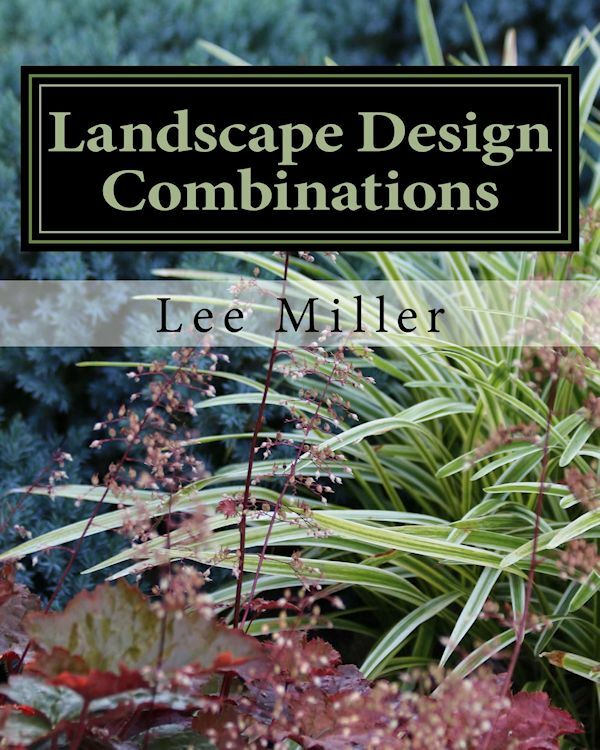 It's one of my favorite foliage selections for creating design combinations. 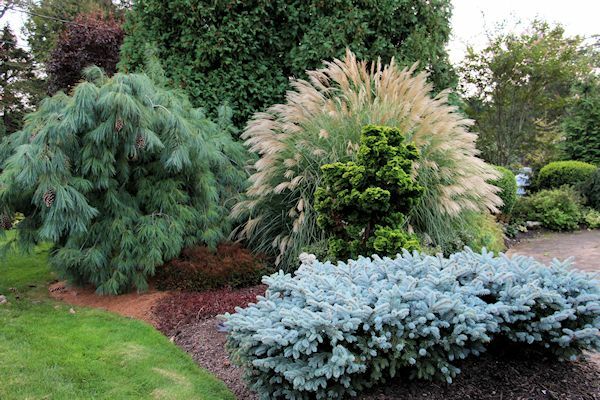 Golden Hinoki Cypress, Blue Montgomery Globe Spruce and Weeping White Pine are some of the mature evergreens in the pool surround garden. 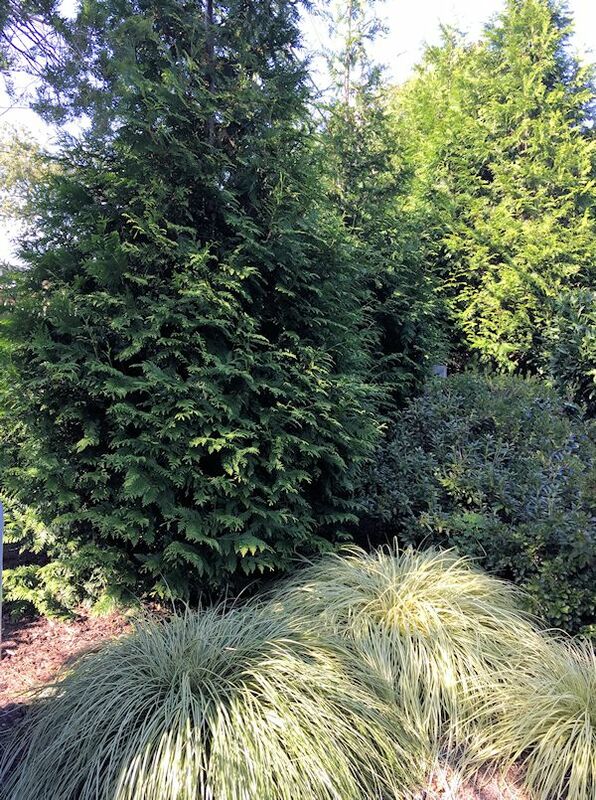 Behind the Hinoki Cypress is a view of 'Yaku Jima' Dwarf Maiden Grass as it fits in with the rest of the planting. I enjoy how grasses can add movement, especially in the fall. Around to the other side of the property, behind the pool garden, is the secret garden with mature Leucothoe and Japanese Forest Grass (Hakonechloa macra 'Aureola'). A bluestone path along the right of this view leads to the rest of the garden and ends at a decorative birdbath, which you may recall from a previous visit. 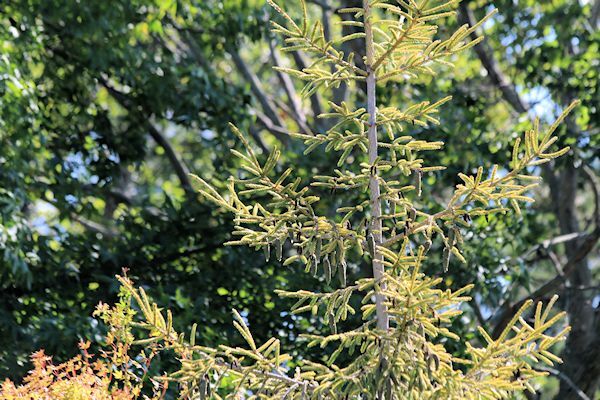 As this month's tour nears its end, here is a view of the new Skyland's Spruce. 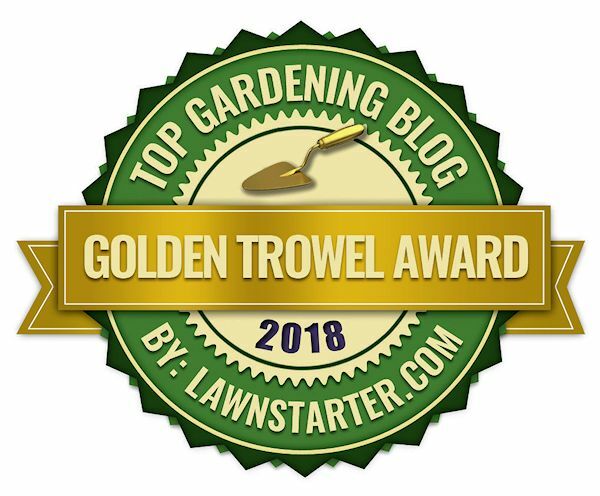 Just planted this June, it has been adjusting very well in the southwest garden border and proudly displays its beautiful golden foliage. 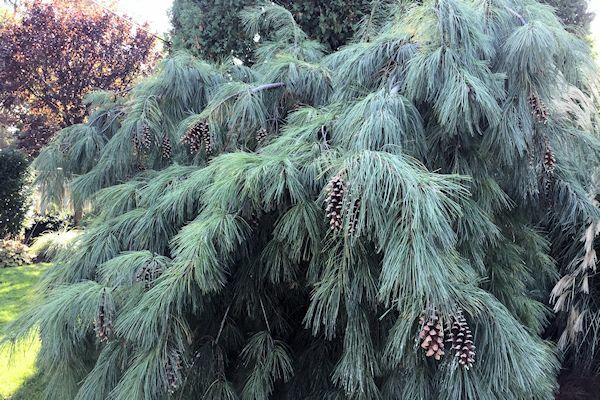 The same variety of this tree was planted in the front of the property as a memorial for my mom, who passed in 2008, so both trees have a special place in my heart. 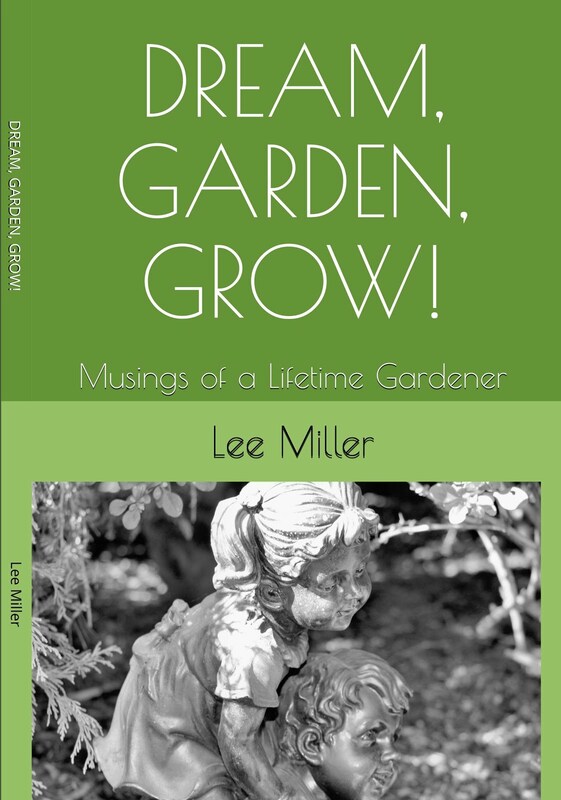 Talking about special places in my heart...if you are familiar with my second book, you may recall a dedication to Joan, the lady next door who taught me an appreciation for gardening. 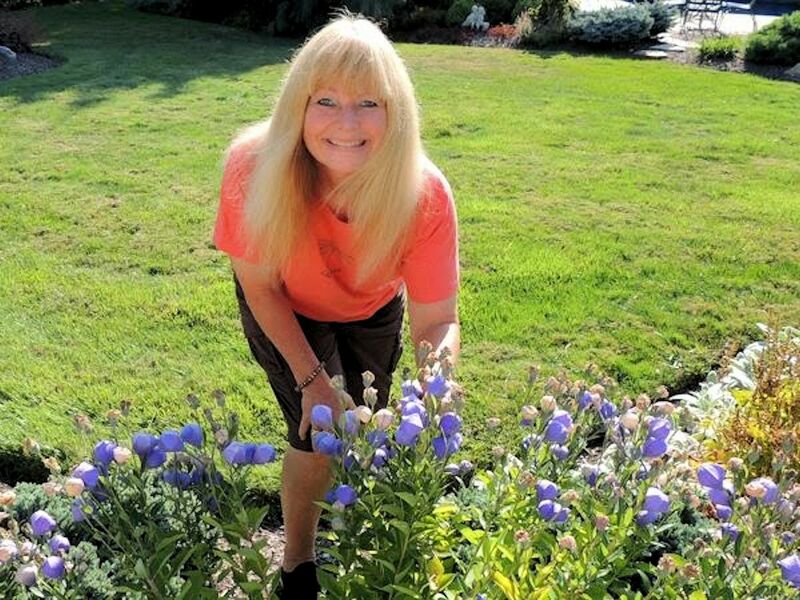 These are her Montauk Daisies, which have grown in her garden for as long as I can remember. The flower also happens to have been my mom's favorite, and since Joan's blooms always look so beautiful, each autumn I venture across the street with my camera in hand to capture a view. Lastly, as we part, I'll leave you with a view of the street where I have resided all my life. It always looks so nice this time of year. 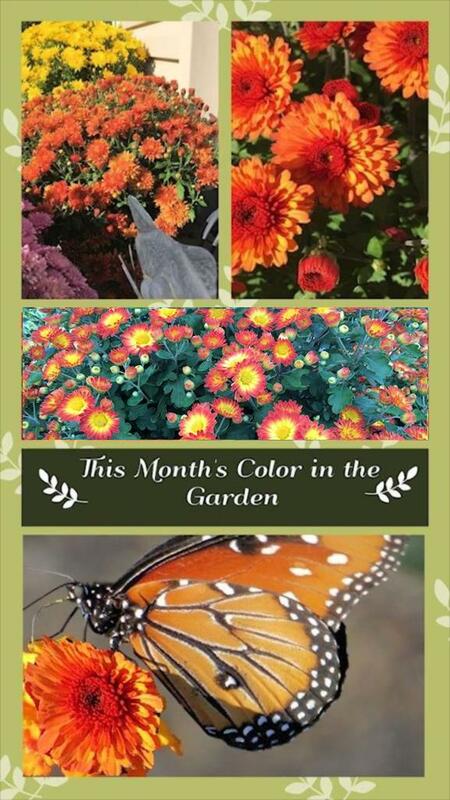 Autumn is upon us in the northern hemisphere and it's time for another This Month's Color in the Garden. 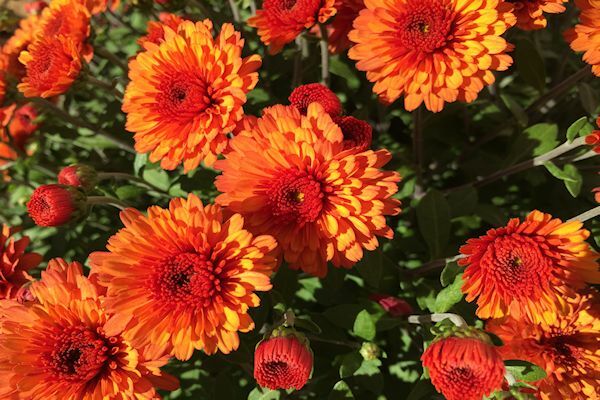 For the month of October the feature color is orange and Chrysanthemum comes to mind, as it is a favorite fall addition for many a gardener, supplying a burst of color for the landscape as the temperatures cool. 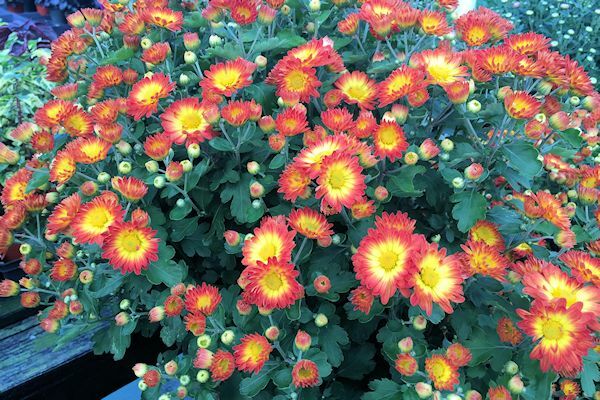 Chrysanthemum, commonly referred to as mums, are characterized as perennials in many areas, but are also treated as annuals by many gardeners. Their bright colors and variety of blooms are an attraction in the autumn garden. 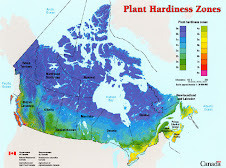 Depending on the specific variety, most mums are cold hardy in USDA zones 5 through 9, which means they can overwinter in the ground. In northern areas, it is preferable to plant Chrysanthemums in spring so they have the entire season to become established. 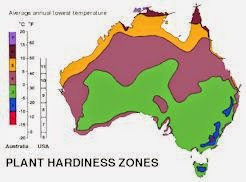 In southern areas, they may be planted in either spring or autumn, but autumn is best to avoid excessive heat. Most Chrysanthemums do well in an organic well-drained soil in full sun. 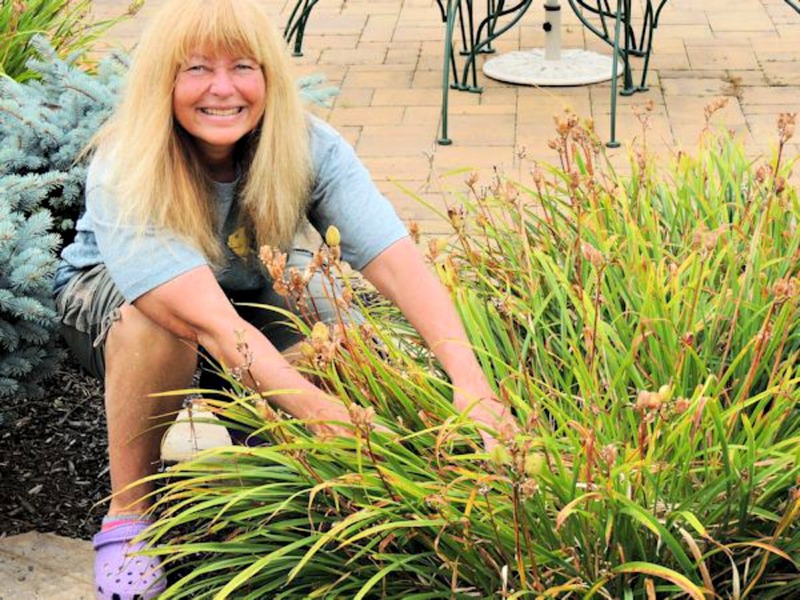 To care for your plants and keep them full, pinch back new growth when it reaches 4-6 inches and continue pinching through June. 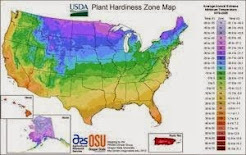 This will keep plants compact and prevent them from blooming too early. There is much history and folklore behind Chrysanthemums. 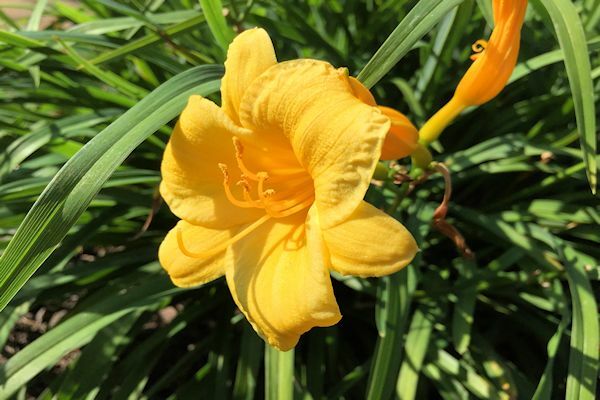 Named from the Greek prefix "chrys-" meaning golden (the original color) and "-anthemion," meaning flower, years of hybridization have produced a full array of colors including shades of yellow to white, orange, purple, pink and red. Chrysanthemums are the November birth flower, the 13th wedding anniversary flower and in Japanese culture, the opening of a chrysanthemum's petals represents perfection. 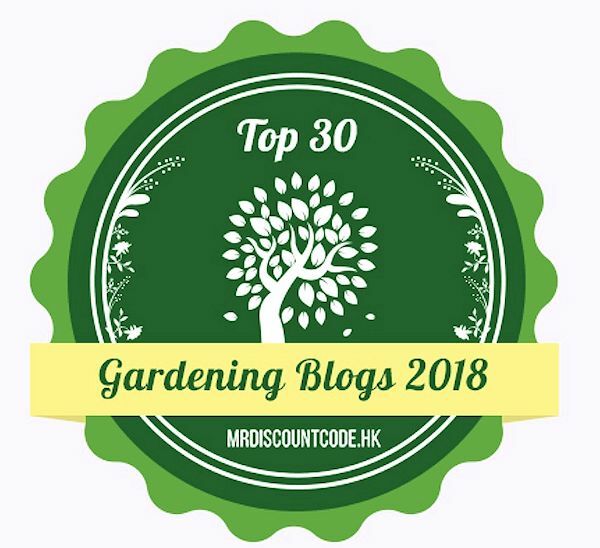 Confucius at one time considered these plants to be associated with mediation and since the 15th century, Chrysanthemums were grown as flowering herbs and considered an honored plant with exceptional powers. Folklore says that a single petal at the bottom of a wine glass will encourage a long and healthy life. Since this month's color is orange, orange is known to symbolize joy, warmth, optimism, happiness, freedom, expression, enjoyment and creativity. Throughout history, the American Indians have associated the color orange with kinship, and in China and Japan, the color orange symbolizes happiness and love. 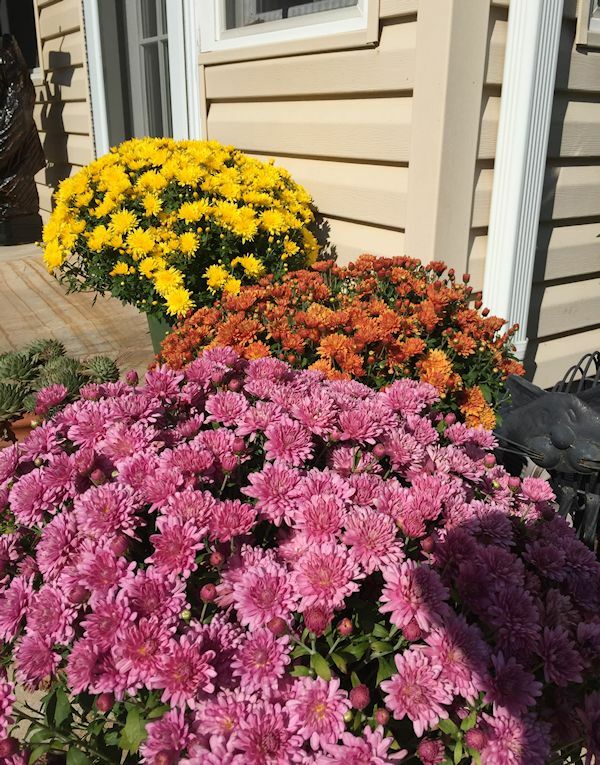 Chrysanthemums come in a variety of colors. Whether you are in the northern or southern hemisphere, Chrysanthemums can be an excellent addition to your garden. 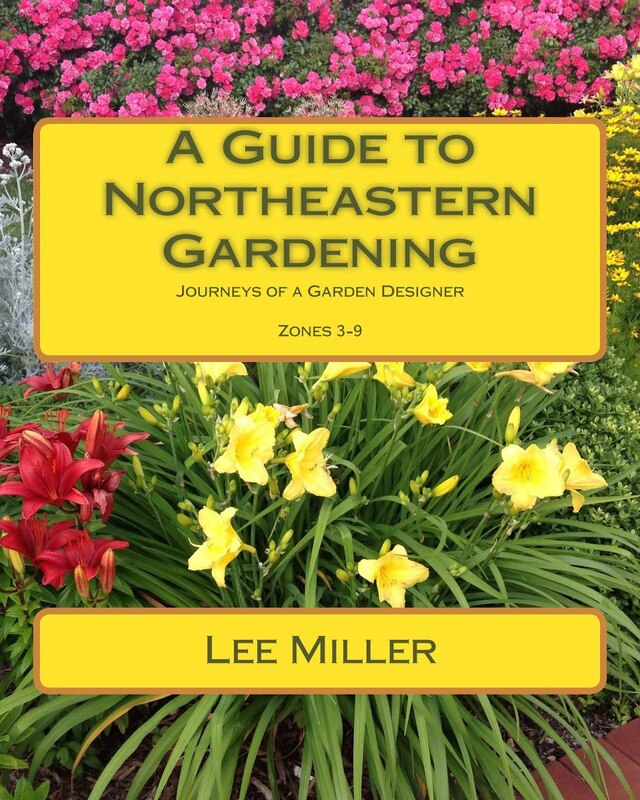 Other orange blooming flowers include Gaillardia (Blanket Flower), Lillium, Lantana, Marigold, Zinnia, Dahlia, Butterflyweed, Helenium, Red Hot Poker, California Poppy or perhaps Bird of Paradise or Aloe for those warmer climates. 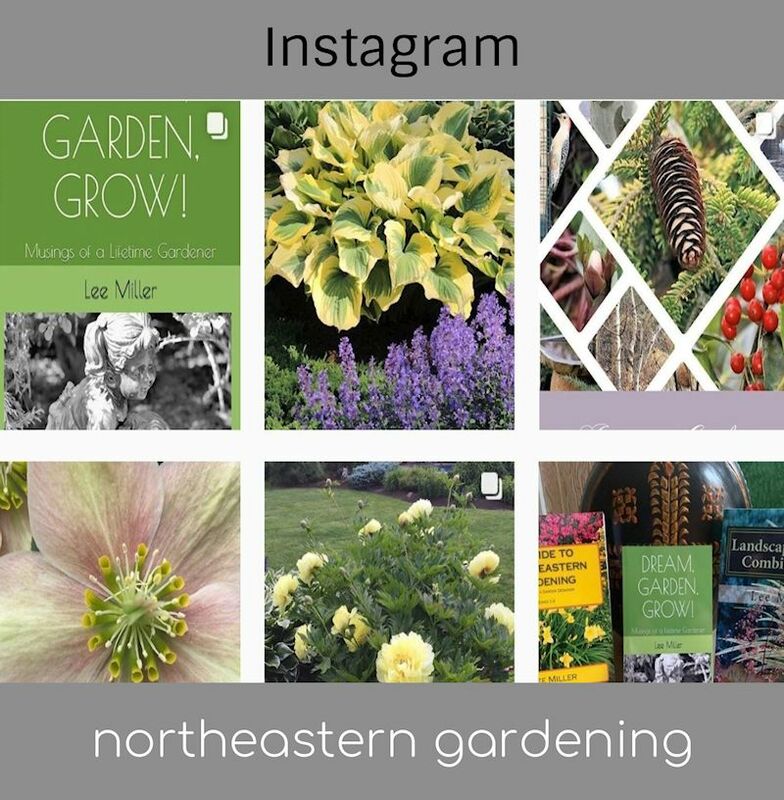 I hope you enjoyed This Month's Color in the Garden for October. 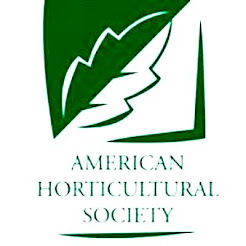 Please do share your experiences with the color orange in your garden, whether it be with plants, hardscape or garden decor. Next, join me for Garden Bloggers' Bloom Day and Foliage Follow-Up on the 15th! See you around the garden!